is it on a motor? TV sergipe no 75W C3 esta codificado? This Thread is made for Signal Reception , Please Post Here your C Band Setup also which Setup you use to get which C Band Satellite. Hi, i'm from Brazil and have a dude. In the footprint shows that the 10E have a ku band for Europe and other for Africa. For the Brzil is the C band. I want to know: are the same feeds, same keys, same fta in the ku and c band? 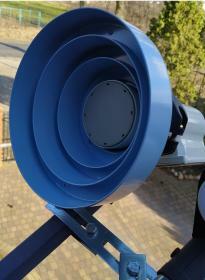 No it is not same frequence and etc..
is a feed horn necessary for an offset dish to get c band signals? does it really increase signal reception or not? 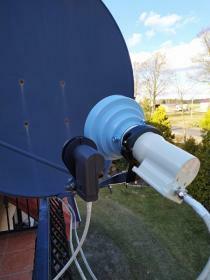 With a 1.06 offset Triax dish with a DMS International BSC421 13K C-Band LNBF. It doesn't really increase signal but more reduces noise / interference and usually is critical as is it's position. You can use a prime focus c band feed horn or scala plate on an offset dish but at an angle leaning back from the face is best to get a similar result which suggests it's more ground noise and ground based reflections. Altering the position of a c band feed horn and or lnb can improve some channels while reducing or knocking out reception on others on the same sat. I just started my DX adventure on C-Band. Which positions are reachable in Poland with 120cm offset dish. Below photos of my dish and LNBF with feedhorn.